All Decked Out is located in Summerland, a cute little beach community right between Carpinteria and Santa Barbara. The home is just a short drive to Santa Barbara lower village and downtown Santa Barbara. Very easy access to Butterfly Beach and Padaro Beach. This home has everything you need for your next vacation. Movie Theater with 3D, WiFi, Foosball Table, Ocean Views, Electric Car Charger in the garage, luxurious furnishings along with the tasteful art and decor. The master suite is a true oasis and you'll feel like you're in a five star resort. All decked out is perched at the top of a hill overlooking the town of Summerland with a bird eye view of the pacific ocean and the channel islands. You'll absolutely love the charm of this little community and the views will surely inspire you. Once inside the home you'll appreciate the flow of the open floor plan. To the right of the front door you enter into the great room with wooden floors and large floor to ceiling glass doors that disappear into the walls, opening the house onto the large outdoor deck. 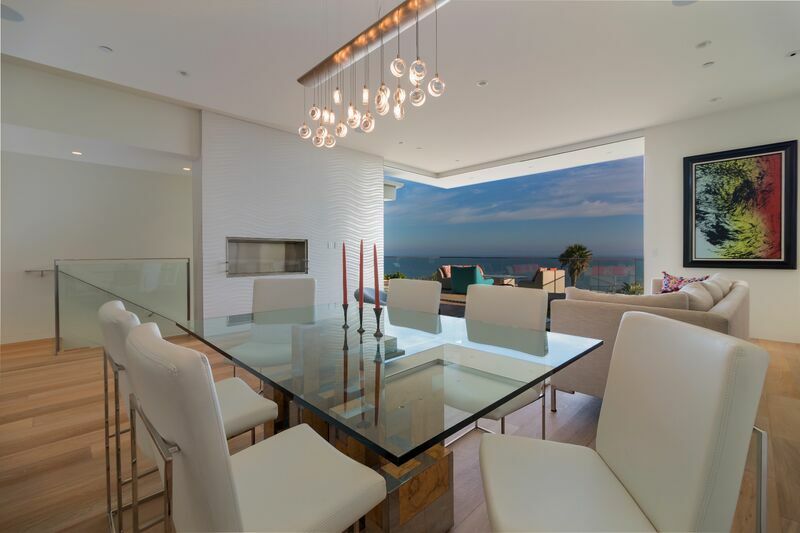 With the doors open you can feel the gentle ocean breeze flow through the home. The cozy living room has a sectional sofa with a chaise and for ambience an eco friendly liquid ethanol fireplace. The outside deck is the perfect location to relax, enjoy the sunny California weather and watch the busy world below you dissolve away into the bliss of your rest and relaxation. You also have the best seat in town for the most beautiful sunsets from the deck. There is a stainless steel gas grill tucked away in the corner of the deck so you don't have to miss out on the amazing views when it comes time to cook dinner. The kitchen has clean lines and simple functionality. The glass top cook top makes clean up a snap. The built in appliances fit naturally into the open space. The kitchen counter has 4 bar stools, and the dining area will comfortably seat six. The Master bedroom is located on the main floor of the house and takes up the entire east wing of the home. The bed is fittingly, a California King with bedside tables and lamps. There are floor to ceiling glass doors leading out to the back deck. For privacy you can lower or raise the blinds with the simple push of a button. The master bathroom is inspired, complete with a door leading out to a private enclosed patio. The floors are tile, there is a soaking tub and a walk in shower with natural stone and glass. Two sinks make it easy to get your day started, and the walk in closet has plenty of room for your clothing. Downstairs you will find the movie theater with the projection screen. The projector is 3D capable, so whether you are coming down to watch the game, or to watch the latest blue ray 3D action flick we got you covered. Enjoy it all complete with surround sound. The two guest bedrooms here on the lower level each have queen beds. One of the rooms has a door leading out to the lower deck where you have partial ocean views, foosball table and two chaise lounges. The guest bathroom is located adjacent to the two bedrooms and has a tub/shower combo. The full size laundry room has plenty of room with counter space, cupboards and a sink. Simply marvelous! We will be contacting Spencer to book for next year. Thank you! It was memorable!! Thanks for everything !